It was the night before Thanksgiving 2011, and Stacey Bartletti had much for which to be grateful. She was coming out of a postnatal fog, having delivered her second premature baby boy in less than three years, and surviving the sleep deprivation that comes when there’s a 2-year-old and a newborn in the house. Something was wrong with her healthy, spirited toddler. The thoughts of Stacey, whose father died of cancer in 2003 within weeks of his diagnosis, went right to the disease that every mother fears. She was wracked with guilt about not having noticed the cantaloupe-size mass in Jaydon’s tummy previously. After an agonizingly long holiday weekend, Stacey and Jay, with baby Rowan in tow, took Jaydon to the doctor, who confirmed their fears. 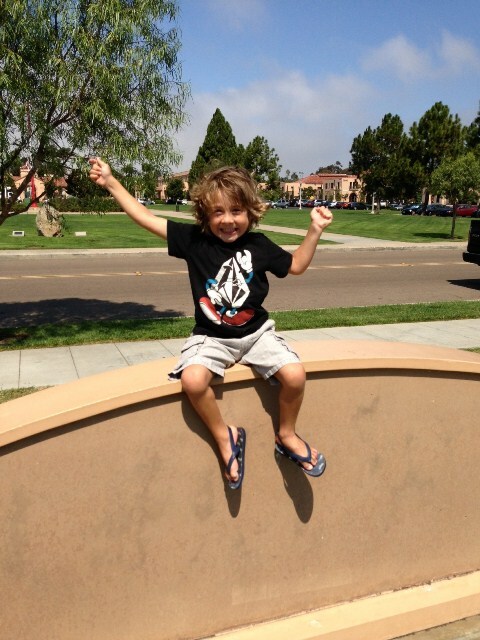 Jaydon Bartletti, honorary race starter for the San Diego edition of the Run to Fight Children’s Cancer on Oct. 26. And so began the southern California’s family’s life-changing journey through the physical and emotional pain of tests and treatment, and the incredible joy of recovery and a second chance. The Bartlettis’ trek will continue on Saturday, Oct. 26, as Jaydon serves as the starter for the inaugural San Diego version of the GCU Run to Fight Children’s Cancer. The five-kilometer (3.1-mile) race will be held in NTC Park at Liberty Station, 2455 Cushing Road, and same-day registration opens at 7 a.m. The 5K is scheduled for 8:30, followed by a 1-mile family run at 9:15 and a quarter-mile walk for cancer survivors at 9:45. The event also will include family entertainment, arts and crafts, music, jump castles, clowns, appearances by professional sports team mascots and more. Registration fees for the 5K are $40-$45, and $20 for the family run; the survivors walk is free and open to all participants. To register and for details on voluntering and/or sponsorships, visit www.runtofightcancer.com. Proceeds from the San Diego race will be donated to the Ronan Thompson Foundation (www.theronanthompsonfoundation.com) and Max’s Ring of Fire (www.maxsringoffire.org) to help fight childhood cancer. Just a week after his parents first noticed the bulge in his tummy, on Nov. 20, Jaydon underwent surgery at Rady Children’s Hospital in San Diego to remove the tumor, which had encapsulated one of his kidneys. The kidney was removed and a portable catheter implanted in Jaydon’s chest for the chemotherapy. The hospital became his second home, as well as that of his mother and younger brother. Jaydon at the start of cancer treatment. His cancer is now in remission. After nine days in the hospital, the boy was released, but the lab tests on the tumor hadn’t yet come back. The Bartlettis had been told by most of his doctors that Jaydon had a Wilms’ tumor, a rare kidney cancer, but they still didn’t know the stage of his cancer. As they brought their son home, Stacey and Jay were encouraged to be “as normal as you can be,” but not to take their son out in public because his immune system was compromised. 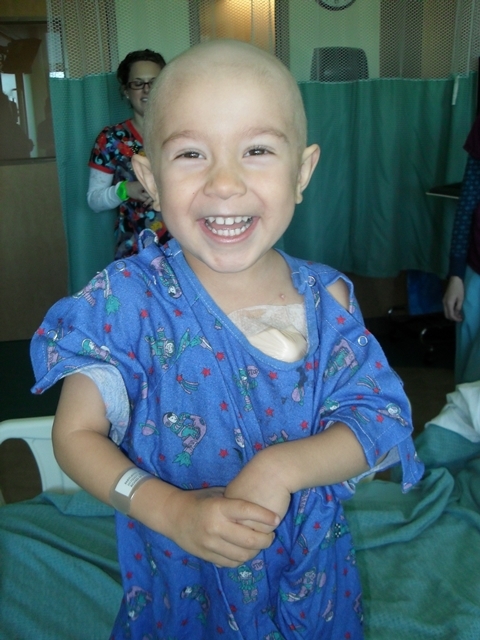 Depending on the results of the lab tests, Jaydon would have his first chemo the week before Christmas. When the results arrived, the news was worse than they had hoped. Jaydon had clear cell sarcoma of the kidney, a rare, aggressive cancer that could spread to his brain and bones. The family rushed back to Rady for more scans, which fortunately revealed that the cancer had not spread. But Jaydon would need seven to nine months of chemo and regular scans. The Bartlettis returned home and tried to enjoy the holidays. Jaydon’s silky blond locks were cut short – his first major haircut – and it wasn’t long before it began to fall out on his pillow and worse. During their stays at the hospital, Stacey noticed that some children’s rooms had a quiet, sad, foreboding atmosphere. To make life on the unit more bearable, nurses and doctors were invited to Jaydon’s room for dance parties to take everyone’s minds off cancer. But by June, seven months after he started treatment, Jaydon’s body and spirit were depleted, and he wanted nothing more to do with dancing. The treatments were over for now, and it was time to hunker down at home. During the first year after his surgery and treatment, Stacey came across too many parents at the hospital whose children had gotten sick again or died. Jaydon’s cancer is still in remission. “Cancer changes so many things about your life,” Stacey said. “You don’t take things for granted as much, and you do things differently, like checking his heart to make sure the chemo didn’t strain it too much or that his remaining kidney doesn’t have too much pressure placed on it. 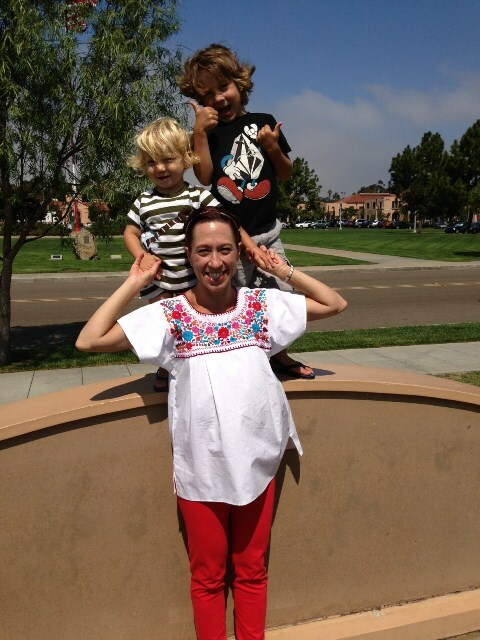 Jaydon and his brother, Rowan, with their mother, Stacey Bartletti. The mission of the GCU Run to Fight Children’s Cancer is to create community awareness about childhood cancer and provide support for families and children affected by it. GCU’s first run in Phoenix was held in October 2011, drawing more than 1,500 runners and spectators and raising $30,000 for Children’s Cancer Network (www.childrenscancernetwork.org). It was so successful that a second run was held six months later, in March 2012, more than doubling attendance and raising $40,000 for the local nonprofit. A third race was held in March 2013, raising $104,000 for the Children’s Cancer Network and for Phoenix Children’s Hospital. The 2014 race in Phoenix is scheduled for Saturday, March 9, at GCU’s main campus in Phoenix. Patti and Steve Luttrell of Tempe and their daughter, Jenny, founded the Children’s Cancer Network after their son and brother, Jeff, was diagnosed with leukemia at age 5 in1993. The network provides financial, educational and psychosocial support to children and their families. “GCU has been a huge support to the Children’s Cancer Network in terms of moving us forward to build a strong foundation and help more Arizona families battling childhood cancer,” said Patti, an adjunct faculty member in GCU’s College of Nursing and Health Care Professions. “The run has provided an avenue for families to come together and develop and experience that sense of community, and the families have the opportunity to give back by participating in the run, which helps in their healing,” she said. Proceeds from the Phoenix events enabled the network to open last spring a resource center in Chandler, where children and their families find education and support, and to launch “It’s All About You,” a program for siblings who also struggle with their brothers’ and sisters’ cancer. Additionally, earlier this month, GCU donated space at the nursing school to the network for its survivorship celebration. “We just really value all that GCU does for the Children’s Cancer Network and its community because the impact it has on so many is tremendous,” Patti said. The Bartlettis will participate in the survivors walk at the San Diego event. Their little survivor has regained his hair and, at 4 1/2, is becoming his old self. He proudly shows off his fading belly scar, which looks to his mother like a smile, to little girls on the playground. He loves cupcakes, running and playing with his daddy, is enamored with trains, soccer and basketball, and just got his first skateboard. Jaydon’s different, too, more outgoing, more drawn to older children. He has started asking Stacey about cancer. “It’s so hard to know what your child would have been like without this experience. 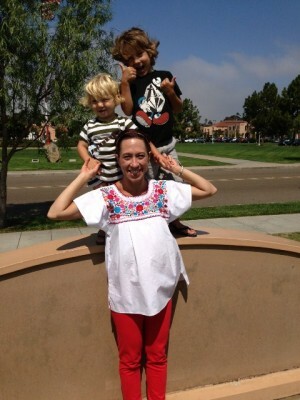 And even though we’re out of it, having an ill child is still so frightening to me,” she said. “The one thing that’s so amazing, and what makes it all OK and worth it, is to feel the love that’s out there in the universe.